Most customers these days are used to shopping online, and they generally know what to expect. However, these expectations can work against you if your store operates any differently than how the customer thinks it will. If you lay out your store policies in an easy-to read format, and in an easy-to-find location on your website, you can help avoid misunderstandings with your customers and keep them satisfied. 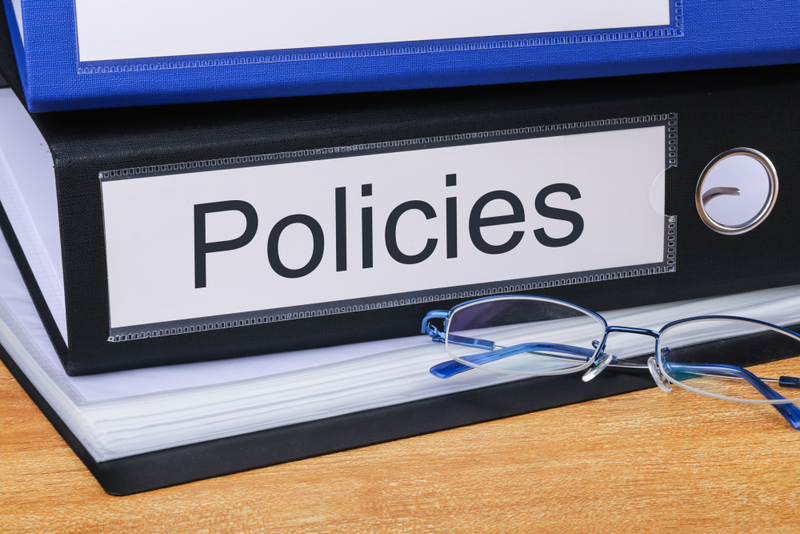 As mentioned, your policies need to be clearly visible and easy to understand. Here's how to write them. In a perfect world, no customer would ever need or want to return their purchase. But we're dealing with the realities of eCommerce, and the reality is that customers will frequently want to return items for a large assortment of reasons. Everything from a product damaged in shipping, to a customer simply changing their mind, can and does happen every day. For which items do you offer returns, and under what circumstances? Do you offer returns for all products, or only some? Are there categories of products for which you will not accept returns? How about specific manufacturers? Specific product types? What if an item is damaged? Will you accept returns only on unopened, unused merchandise? Or will you have a no-questions-asked return policy for all your products? Lay this out as clearly as you can. How long do customers have to initiate a return? Do they have 7 days, 14 days, 30 days, 90 days, or longer? State this very clearly and avoid variables like "one month," because one month can be anywhere from 28 to 31 days. Also, when does this timeframe begin: on the day of the order or the day of receiving the package? What about an open-ended return policy stating you'll accept returns at any time? Some retailers have great success with policies like this, but it can be risky. Who pays the cost for shipping the return? This can vary depending on the reason for the return — for example, if the item is damaged or you made an error with shipping, you'll cover the cost, but if the customer simply changed their mind, the return shipping charges fall to them. Make this as clear as possible. Do you charge a restocking fee? A restocking fee covers return costs that aren't shipping-related. For example, an item you need to repackage for sale, or the loss you take by selling a product that's been previously opened or due to the item losing value over time. How does the buyer ship the item? Do you provide a shipping label and schedule a pickup, or does the customer need to handle this on their end? Do you use an RMA system to handle returns? An RMA (Return Merchandise Authorization) system provides you with a means to request information from the customer, such as photographs and details, before accepting the item for return. If you plan to use an RMA system, explain this in your return policy so customers know where to start. If you're struggling to write a good return policy, get some inspiration from competitors. Read return policies of other merchants that sell the same type of products, and you'll have some examples to help you figure out what's normal for your industry. You can also use 3dcart's Return Policy Generator to make writing a bit easier. Stick to the shipping timeframe you gave the customer at the time of the order. In other words, keep the promises you make about shipping. If you don't give the customer a specific timeframe, you are required to ship the product within 30 days of placement of the order. Some situations allow you to extend the timeframe, such as to 50 days if the customer's order includes an application for credit. If you find that you can't meet the promised timeframe or 30-day deadline, you need to get permission from the customer to ship their order later or promptly provide a refund. Your request to delay shipping must include an actual shipping date. If the customer opts for the delayed shipping, you're required to meet the new timeframe. If the customer instead chooses the refund, you must follow through right away. What do you charge for shipping? List your standard rate or rates and when they apply. If there's a lot of information to impart to the customer, use a table or chart that shows the different shipping rates you use and under what circumstances. You might use differing rates for shipping with different timeframes, number of items in the order, or size, weight, and other factors. If you offer free shipping with certain restrictions, explain how a customer's order can qualify, whether minimum order level, under a certain weight, or any other system you have in place. Do you have handling charges on any of your products? Handling includes the cost of the packing supplies you'll need to ship the order and the time it takes to do it. If you charge for handling, disclose this on your shipping policy — and it's also a good idea to mention it on your product pages, too. How long will it take you to pack and ship the order? Once a customer places an order, what's the timeframe for packing and shipping? Make sure you commit to a manageable timeframe — for example, don't say you ship "immediately" unless you really can pack and ship the order at any moment, 24/7, as soon as the customer clicks "Place Order." Instead, state a reasonable timeframe that matches what you're capable of doing. This timeframe can be specific, e.g. "All orders placed before 1 PM EST will be shipped out the same day; all orders placed after 1 PM EST will be shipped the next day." It can also be a range, such as "orders are shipped within 7 days" or specific shipping days, such as "orders ship every Friday" or "orders ship on the 1st and 15th of every month." What shipping carriers do you offer? Do you use one carrier exclusively or offer a choice? Do your different shipping rates all come from one carrier, like Priority and Express Mail from the USPS, or do you ship with different carriers to provide different timeframes and rates? Customers need to know what their options are. Do you provide tracking numbers or delivery confirmations? How do you get them to the customer? Can they receive their tracking information in their email or will they need to log in to an account on your online store? Are there any shipping restrictions? Are certain items restricted to one carrier, or are there addresses you're unable to ship to at all? For example, UPS and FedEx don't deliver to PO boxes, so if you only offer these carriers, you'll need to state to your customers that you can't accept any orders with a PO box as a shipping address. You might also restrict orders that would need to be shipped to APO military bases overseas, or restrict large items from shipping to Alaska or Hawaii to avoid prohibitive air mail costs. It's important you provide this information up front so customers will know ahead of time what to expect, and whether they should go through with their orders. You're going to have to collect information from your customers — it's part of the nature of your business. You need email and physical addresses, names, and possibly phone numbers. Depending on what you sell, you may end up with additional information, such as whether the customer has children and their ages. Or if you sell any type of item that customers might be embarrassed by ordering, the fact that they ordered from you at all may be something they'd prefer to stay private. What information do you collect? Is it just personal data like name, address, email address, phone number, etc. or do you also collect demographic data like age, gender, occupation, and so on? Do you retain financial information like credit card or bank account numbers? Disclose the nature of all the kinds of data you collect and store. How do you store and protect this data? You need to inform your customers of the security measures you're taking to ensure their data remains safe, hidden, and protected from unauthorized access or use. Who else can see this data? Do you share it with any third parties or partners, or are you and your employees the only ones with access? Do you sell or provide customer information to any other companies? Since the purpose of your policies is to define your methods of operation for your customers, your policies need to be easy to find on your website. The best means to make them visible is to create a page for each policy and link them in your site's menu, header, or footer in an easy-to-see location. 3dcart lets you create unlimited content pages for your online store and place the links where you need them, which is one of many features that makes 3dcart the best eCommerce platform for running your website. You can learn more about building your online store by checking out our ebook below. It's free, and packed with helpful, easy-to-follow information to help you craft the eCommerce website you've always wanted. Take a look!